More than 150 sailors from 25 nations racing across six classes are set to compete at ISAF Sailing World Cup Qingdao in China from 14-18 October 2014. 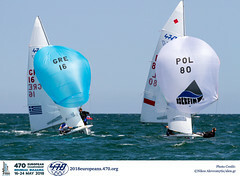 As the dust settles on the ISAF Sailing World Championships many of the racers are heading east to compete at the second edition of ISAF Sailing World Cup Qingdao. Competitors across the six events will be vying for their share of the 180,000USD prize money. 18,000 USD will be awarded to the gold medallist with 8,000 USD and 4,000 USD going to second and third place. The Men's 470 fleet will see 22-boats line up on the start line in Qingdao with a blend of experience and youth amongst the entrants. 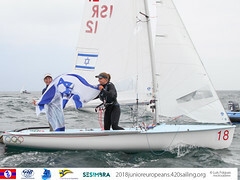 2013 and 2014 Junior 470 World Champions Jordi Xammar and Joan Herp (ESP) made major inroads at the Santander 2014 ISAF Worlds, finishing seventh overall. The pair took the Medal Race bullet in Santander and having proven they can beat some of the finest Men's 470 sailors Xammar is coy on his team's chances in Qingdao, "It would be great [to win] but I think it is too early to take a win in a senior event and we have still many things to learn but for sure we are going to fight as much as we can. "Our aim for the World Cup in Qingdao is to keep learning from the best sailors and give our best in every race, we don't want to fight for one place, just try to be as higher as possible. "We are expecting a really high level competition and we know that the starts are going to be very important because with a bad start is going to be very difficult to recover." The competition is set to be high in the Men's 470 with World #3 Panagiotis Mantis and Pavlos Kagialis (GRE), World #6 Sofian Bouvet and Jeremie Mion (FRA) and two time Olympian Onan Barreiros with crew Juan Curbelo Cabrera (ESP) joining Xammar and Herp in the pack. 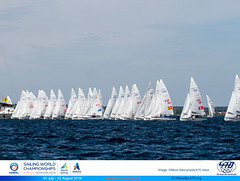 The Women's 470 fleet will see a tight knit 10 boat fleet take to the water. The experienced Ai Yoshida and Miho Yoshioka (JPN) will go into the event as favourites but with World #10 Shasha Chen and Haiyan Gao (CHN) and a young, fresh Chinese team joining them they will have their work cut out.